FormLA designed, built and maintains two gardens that truly beautify the La Canada Valley: The La Canada Public Library demonstration garden and the Olson residence. Inherently sustainable, both gardens illustrate effective use of beyond-California native, climate-compatible plants to reduce water consumption while producing inviting, architecturally compatible outdoor living spaces. 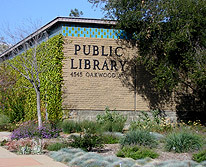 The La Canada Public Library demonstration garden is designed to educate residents about the plants native to the 5 Mediterranean climates in the world. These plants are inherently compatible with Los Angeles’ desert climate. FormLA recently completed phase 2 of the 5-phase project, and we are excited for visitors and the community to see the complete California and Mediterranean demonstration gardens. The residence on the tour presents a very traditional home with a cottage garden, mixing natives and Mediterraneans to produce an architecturally unified feel. Two large, mature, native Oak trees frame the front of the house, providing both focal points and terrain challenges. FormLA surrounded the oaks with exclusively California native plants to create color, privacy and beauty that compliment rather than compete with the needs and visual appeal of the oak.